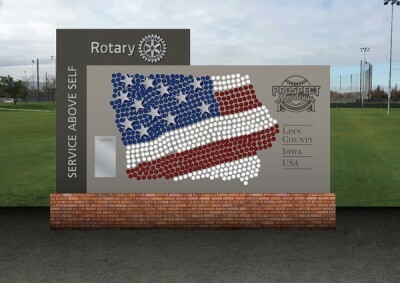 Tens of thousands of people will be coming to Prospect Meadows each year and one of the first things they'll see is the eye-catching Rotary Donor Wall at the new sports complex. "It's a way for people to be part of the project with their grandchildren's names or their parents' names or whatever they'd like," said Jack Roeder, the general manager of Prospect Meadows. The Donor Wall will be an attractive backdrop for individuals and teams who want to pose for pictures, including championship teams after they've won a big tournament. A pledge check must be made in full, payable to Prospect Meadows at 1890 County Home Road, Marion, Iowa, 52302. Pledges also can be made online in two installments at ProspectMeadows.com/donate.